Well, my first impressions as a kid haven’t changed much. 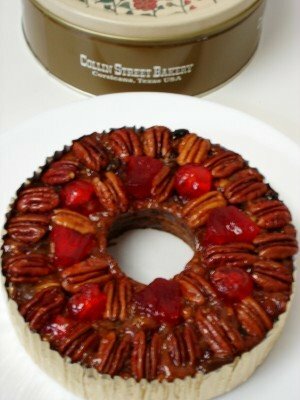 If you like the flavor of sugar and nuts, you’ll like the Collin Street fruitcake. The 1 pound, 14 ounce cake looks very pretty when it arrives, a light brown cake in gold foil, decorated with beautiful pecans and cherries (the photo on the right is a bit blurry because if I used flash all you'd see is the shiny glaze). And indeed, the first two ingredients on the list are pecans and cherries; followed by corn syrup, and sugar. Further down the list are invert sugar, hydrogenated soybean oil, and high fructose corn syrup, as well as natural and artificial flavor. For $21, I was expecting better ingredients. The fruits used in this fruitcake are cherries, pineapple, raisins, papaya, and orange peel. Notably lacking: any sort of booze. The aroma is of toasted pecans, sweet rolls or coffeecake. This is a pecan-heavy cake—Collin Street lists the fruitcake among three other “nut cakes,” as well as another fruitcake, called the Texas pecan fruitcake, which doesn’t look much different from the original fruitcake. I guess I’ll have to try that one at some point. The flavor really can be described in one word: sweet. It’s a praline-like, syrupy flavor, with some fruity notes but not much. The cake is dense and moist. If you like the taste of sugar and pecans, this will taste good, but I find it one-dimensional. I’m very disappointed in this cake, frankly. I am willing to give all fruitcakes the benefit of the doubt; that’s the point of this blog, to try to dispel the anti-fruitcake bias. But I see now how people come up with those stupid jokes about what to do with a fruitcake. This fruitcake is OK but extremely boring, and if I continually got this one as a gift, I’d learn to resent its presence and begin thinking creatively about how to get rid of it. Because the main characteristic of fruitcake is its heavy richness, these cakes are not easily dispatched. You can’t cut it up in quarters and binge it down as you could, say, with a bundt cake. So now I have about 7/8 of this cake in my refrigerator, inedible and a waste of calories. The worst part about this project is that most of the time, if you have some high calorie product you don’t want to keep in the house, you can bring it to work and the vultures will descend and make waste of it in a few minutes. But with the anti-fruitcake sentiment out there, I think this cake would just sit there like a weird uncle at a party, being politely ignored. On the other hand, for a nation weaned on McDonald’s, Twinkies, and Bud, this might be just exotic enough, but with a non-threatening flavor, to get eaten. Maybe I’ll leave it in the park near my house for the urban coyotes to eat.